The Franz Fekete Stadium is a multipurpose arena in Kapfenberg, Austria. 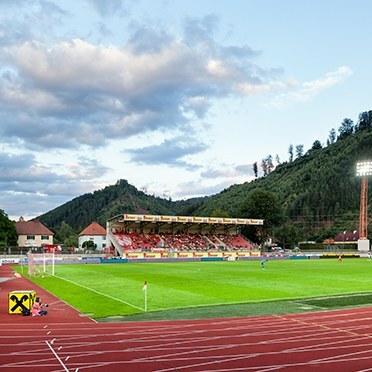 Mainly used for football matches, it is home to Kapfenberger SV, who competes in the Austrian Liga 1. The 12 000 capacity stadium was built in 1987 and until recently was still operating many of the original floodlights and columns. 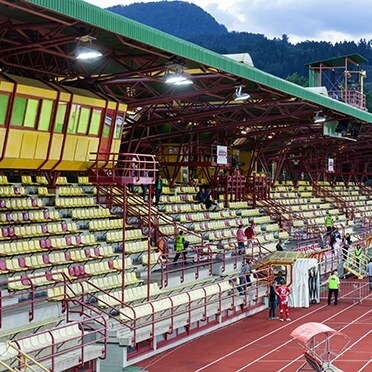 The stadium decided to refurbish the floodlights on the 65x105m playing ground, to meet the guidelines set by the Austrian football league. Based on the lighting design of the Engineering Office Peter Samt, the energy management company eww ag Kommunaltechnik won the tender together with Thorn Lighting as the lighting partner. 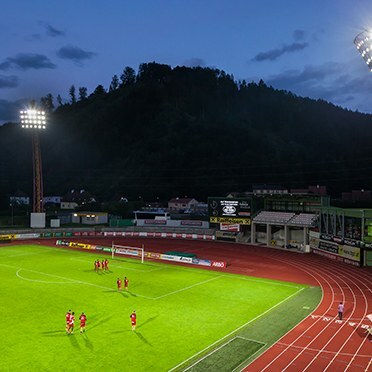 The lighting solution should needed to the following objectives: Increase the light level to meet the Austrian football league guidelines of 1000lx vertical and 1400lx horizontal illuminance. Use existing columns to save on installation costs. Quick delivery time and reduce energy demands and costs. The project involved replacing over 110 inefficient 2kW and 3,5kW floodlights throughout the grounds. 108 2kW Thorn Altis high intensity discharge floodlights, specifically designed for high definition TV broadcasting, were chosen to meet the specification. Altis features a unique optical design. It provides an unrivalled combination of photometries to provide the right levels of vertical illuminance. Altis provides a good colour rendering index and colour temperatures, needed for a high quality viewing experience. Excellent thermal management and a well thought out mechanical construction further ensure excellent consistency and stability of light over time. In addition 10 Champion asymmetric floodlights were used in surrounding areas. The Champion floodlight incorporates a unique flat glass concept and an integrated visor for total control of glare and obtrusive light (0 cd at 90°). The new installation increased lighting levels from 670lx on the vertical to around 1260lx and 1052lx on the horizontal to above 1600lx, meeting the Austrian guidelines for the football league. Roland Wegscheider eww ag Kommunaltechnik Project Leader, adds, “We were very happy working with Thorn. They were very reliable with the fast delivery times, the products were received within three weeks of placing the order and the customer service throughout the projects was extremely good”.